At 10 PM last night (Sunday night), news came out of a bomb blast at a movie theatre named `Shringar' at Ludhiana. Google news now has 32 news items about this. Some of these articles, and some of the television coverage, blurred the lines between this movie theatre and the listed firm named `Shringar Cinemas'. Many a viewer/reader might have felt that an outlet owned by Shringar Cinemas was bombed. The CMIE website shows a clarification from BSE at 9:55 and from NSE at 10:26. Here are the underlying materials from NSE and from BSE. Since trading starts at 9:55 AM, and the information in these announcements might not be common knowledge amongst all speculators, this made me wonder: Was there a false drop in the prices of Shringar in the early minutes of trading? Or, was there excessive turnover where some people made mistakes but smart speculators / arbitrageurs were able to catch this? At first blush, based on this data from Yahoo finance, this does not appear to be the case; the market worked quite fine. 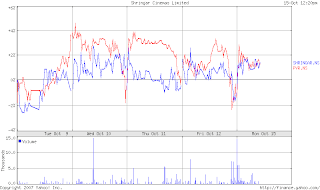 In order to get a sense of what was going on, I compare Shringar against their peer PVR using the Yahoo finance website. Click on the picture to get a better look. this is really nice to increase the timing of share trading.. it will help investors to stay much to search info..